VELUXÂ® offers a complete system for bringing daylight into virtually every space in your home. Take advantage of their 65+ years of experience and solutions for controlling natural light and fresh air. 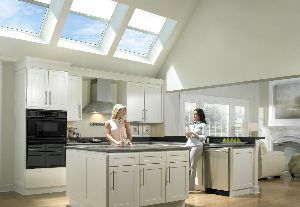 VELUX® offers a complete system for bringing daylight into virtually every space in your home. Take advantage of their 65+ years of experience and solutions for controlling natural light and fresh air. VELUX® holds more than 300 patents in roof window and skylight design and is the preferred brand for American contractors according to every national survey of building industry professionals. VELUX® has been engineering and manufacturing skylights to withstand the harshest of elements. Each product is subjected to rigorous air, water, and pressure testing before every being brought to market. Each skylight is then combined with a custom tailored flashing system. Offer three times more protection against solar heat gain. Resist condensation twice as long as clear glass. Protect interiors by reflecting most of the sun's fade-causing rays.